The Crosman 3576W is perfect for plinking in the garden thanks to an incredible trigger and its explosive power that leads to flatter trajectory and more accurate shooting. 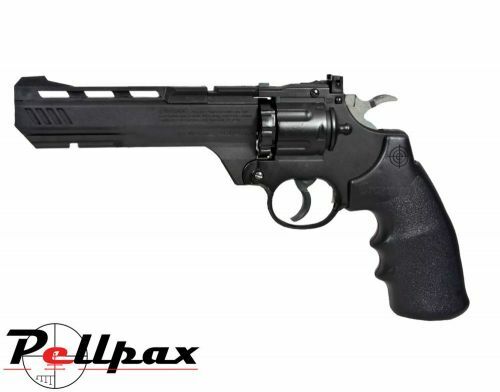 This semi-automatic 10-shot air pistol is unique with revolver styling and finger-molded grip design, perfect for action shooting and proving very popular indeed. Powered by a single 12g Co2 Capsule, the Vigilante is easy to use, as well as accurate with its six inch rifled steel barrel. Check out the full list of Crosman products by heading to their brand page.